I have just finished reading the Life of Pi. Albeit a bit late as it had received rave reviews nearly 6 years ago, I read it as my wife bought it and left it near my side of the bed. It was about a boy who had survived an ordeal at sea with a tiger, of all thing. One thing about being a cat owner, I can say that cats, even at their best behaviour, can sometimes act like their ancestors in a way. 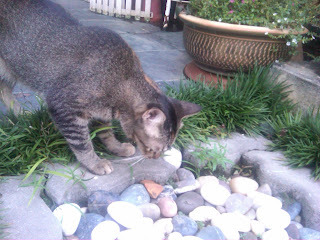 I had this one cat, who was good in catching butterflies and such while they were airborne. Just imagine a cat, jumping nearly 3 feet and landing back down with the butterfly firmly in their mouth. My wife, who never had experience with cats before we decided to adopt these beautiful creatures, were distraught when she saw this act, in front of her. She was actually admiring the butterfly before our cat, Spot, killed it. That was when, after a few times, we considered the occasional 'presents' which they brought home such as rats and birds, which they will they devour, as a normal thing for a cat owner. Yes, our cats eat their kill, in total. I usually had to hear they eat their kills under the bed, each time they go out using our toilet's window.